What are the different types of abdominal hernias? What are the risk factors for a hernia? What types of medical professionals treat and repair hernias? How do health care professionals diagnose abdominal hernias? What types of surgery repair an abdominal hernia? What non-surgical treatments are available for an abdominal hernia? What is the prognosis for an abdominal hernia? Is it possible to prevent an abdominal hernia? An abdominal hernia occurs when an organ or other piece of tissue protrudes through a weakening in one of the muscle walls that enclose the abdominal cavity. The sac that bulges through the weak area may contain a piece of intestine or fatty lining of the colon (omentum) if the hernia occurs in the abdominal wall or groin. If the hernia occurs through the diaphragm, the muscle that separates the chest from the abdomen, part of the stomach may be involved. The abdominal wall is made up of layers of different muscles and tissues. Weak spots may develop in these layers to allow contents of the abdominal cavity to protrude or herniate. The most common abdominal hernias are in the groin (inguinal hernias), in the diaphragm (hiatal hernias), and the belly button (umbilicus). Hernias may be present at birth (congenital), or they may develop at any time thereafter (acquired). Inguinal hernias are the most common of the abdominal hernias. The inguinal canal is an opening that allows the spermatic cord and testicle to descend from the abdomen into the scrotum as the fetus develops and matures. After the testicle descends, the opening is supposed to close tightly, but sometimes the muscles that attach to the pelvis leave a weakened area. If later in life there is a stress placed on that area, the weakened tissues can allow a portion of small bowel or omentum to slide through that opening, causing pain and producing a bulge. Inguinal hernias are less likely to occur in women because there is no need for an opening in the inguinal canal to allow for the migration and descent of testicles. A femoral hernia may occur through the opening in the floor of the abdomen where there is space for the femoral artery and vein to pass from the abdomen into the upper leg. Because of their wider bone structure, femoral hernias tend to occur more frequently in women. Obturator hernias are the least common hernia of the pelvic floor. These are mostly found in women who have had multiple pregnancies or who have lost significant weight. The hernia occurs through the obturator canal, another connection of the abdominal cavity to the leg, and contains the obturator artery, vein, and nerve. The abdominal wall is made up of two sets muscles on each side of the body that mirror each other. They include the rectus abdominus muscles, the internal obliques, the external obliques, and the transversalis. When epigastric hernias occur in infants, they occur because of a weakness in the midline of the abdominal wall where the two rectus muscles join together between the breastbone and belly button. Sometimes this weakness does not become evident until later in adult life as it appears as a bulge in the upper abdomen. Pieces of bowel, fat, or omentum can become trapped in this type of hernia. The belly button, or umbilicus, is where the umbilical cord attached the fetus to mother allowing blood circulation to the fetus. Umbilical hernias cause abnormal bulging in the belly button and are very common in newborns and often do not need treatment unless complications occur. Some umbilical hernias enlarge and may require repair later in life. Spigelian hernias occur on the outside edges of the rectus abdominus muscle and are rare. Incisional hernias occur as a complication of abdominal surgery, where the abdominal muscles are cut to allow the surgeon to enter the abdominal cavity to operate. Although the muscle is usually repaired, it becomes a relative area of weakness, potentially allowing abdominal organs to herniate through the incision. Diastasis recti is not a true hernia but rather a weakening of the membrane where the two rectus abdominus muscles from the right and left come together. The diastasis causes a bulge in the midline. It is different than an epigastric hernia because, the diastasis does not trap bowel, fat, or other organs inside it. Hiatal hernias occur when part of the stomach slides through the opening in the diaphragm where the esophagus passes from the chest into the abdomen. A sliding hiatal hernia is the most common type and occurs when the lower esophagus and portions of the stomach slide through the diaphragm into the chest. Paraesophageal hernias occur when only the stomach herniates into the chest alongside the esophagus. This can lead to serious complications of obstruction or the stomach twisting upon itself (volvulus). Traumatic diaphragmatic hernias may occur due to major injury where blunt trauma weakens or tears the diaphragm muscle, allowing immediate or delayed herniation of abdominal organs into the chest cavity. This may also occur after penetrating trauma from a stab or gunshot wound. Usually these hernias involve the left diaphragm because the liver, located under the right diaphragm, tends to protect it from herniation of bowel. Congenital diaphragmatic hernias are rare and are caused by failure of the diaphragm to completely form and close during fetal development. This can lead to failure of the lungs to fully mature, and it leads to decreased lung function if abdominal organs migrate into the chest. The most common type is a Bochdalek hernia at the side edge of the diaphragm. Morgagni hernias are even rarer and are a failure of the front of the diaphragm. A hernia may be congenital and present at birth or it may develop over time in areas of weakness within the abdominal wall. Increasing the pressure within the abdominal cavity can cause stress at the weak points and allow parts of the abdominal cavity to protrude or herniate. Increased pressure within the abdomen may occur in a variety of situations including chronic cough, increased fluid within the abdominal cavity (ascites), peritoneal dialysis used to treat kidney failure, and tumors or masses in the abdomen. The pressure may increase due to lifting excess weight, straining to have a bowel movement or urinate, or from trauma to the abdomen. Pregnancy or excess abdominal weight and girth are also factors that can lead to a hernia. Most people can feel a bulge where an inguinal hernia develops in the groin. There may be a burning or sharp pain sensation in the area because of inflammation of the inguinal nerve or a full feeling in the groin with activity. If a hernia occurs because of an event like lifting a heavy weight, a sharp or tearing pain may be felt. However, many people do not have any complaint other than a feeling of fullness in the area of the inguinal canal. Complications occur when a piece of intestine or omentum becomes trapped (incarcerated) in the hernia sac. A piece of bowel may enter the hernia and become stuck. If the bowel swells, it can cause a surgical emergency as it loses its blood supply and becomes strangulated. In this situation, there can be significant pain and nausea and vomiting, signaling the possible development of a bowel obstruction. Fever may be associated with strangulated, dead bowel. A Richter's hernia is an uncommon type of hernia that leads to strangulation. Only one part of the bowel wall becomes stuck in the hernia. It won't necessarily cause a complete bowel obstruction initially, since the passageway of the intestine still allows bowel contents to pass, but that portion of bowel wall that is trapped can start to swell, strangulate, and die. Femoral and obturator hernias present in much the same way as inguinal hernias, though because of their anatomic location, the fullness or lumps may be much more difficult to appreciate. Umbilical hernias are easy to appreciate and in adults often pop out with any increase in abdominal pressure. The complications again include incarceration and strangulation. A hiatal hernia does not cause many symptoms by itself, but when a sliding hernia occurs, the abnormal location of the gastroesophageal (GE) junction above the diaphragm affects its function and stomach contents can reflux into the esophagus. Gastroesophageal reflux (GERD) may cause burning chest pain, epigastric pain and burning in the upper abdomen nausea, vomiting, and a sour taste from stomach acid that washes into the back of the throat. A sports hernia is a tear or strain of any tissue in the lower abdomen or groin. It causes pain in the groin or inguinal area. It can involve any soft tissue, including muscle, tendon, or ligament and can initiated by physical activity, usually involving twisting or blunt force trauma to the abdomen. Most often, primary care providers are the first to diagnose and treat a hernia. For hiatal hernias, usually medical, not surgical, care is needed and controlling the symptoms of GERD is the primary goal. Occasionally, a gastroenterologist will be involved in the care to assess the severity of GERD. Some hiatal hernias do require surgery and a general surgeon and/or a thoracic surgeon performs the operation, depending upon the location of the organs in the stomach or chest and the size of the defect in the diaphragm. While primary care providers make the diagnosis of an abdominal wall hernia, it is the general surgeon who performs the operation and repairs the hernia. When a hernia becomes incarcerated, often the patient goes to the emergency department and the physician there makes the diagnosis and sometimes can push the hernia back into place (reduced). If the hernia is reduced, referral as an outpatient to a general surgeon may be an option. If the hernia remains trapped (incarcerated) or if there is concern that the hernia is strangulated, an immediate consultation with a surgeon is required. Hernias in the neonatal period are often recognized by the pediatrician or family provider in the delivery suite or the newborn nursery. A pediatric surgeon may be consulted for their evaluation. For inguinal hernias, most patients notice a feeling of fullness or a lump in the groin area with pain and burning. Physical examination can usually confirm the diagnosis. Femoral or obturator hernias are more difficult to appreciate and symptoms of recurrent inguinal or pelvic pain without obvious physical findings may require a CT scan to reveal the diagnosis. Umbilical hernias are much easier to locate with the bulging of the belly button. Hernias that are incarcerated or strangulated present a greater challenge since the potential complication of dead bowel increases the urgency. The health care professional seeks clues of obstruction, including a history of pain, nausea, vomiting, or fever. During a physical examination, a doctor may often discover that a patient has a markedly tender abdomen. These hernias are often exquisitely tender and firm. The exam may be enough to suspect incarceration or strangulation and require immediate consultation with a surgeon. Doctors may use X-rays or CT scans to confirm the diagnosis, depending upon the clinical situation. Doctors may be able to diagnose hiatal hernias associated with GERD by learning a patient's medical history during his or her physical exam. A chest X-ray can reveal part of the stomach within the chest. If there is concern about complications including esophageal inflammation (esophagitis), ulcers, or bleeding, a gastroenterologist may need to perform an endoscopy. Inguinal hernia repair is one of the most common surgical procedures performed in the U.S. with almost a million operations occurring each year. Most abdominal wall hernias are repaired electively when the health of the patient can be maximized to decrease the risk of both the surgery and the anesthetic. Surgery to repair a hernia may use a laparoscope or an open procedure called a herniorrhaphy, where the surgeon directly repairs the hernia through an incision in the abdominal wall. The type of operation depends upon the clinical situation and the urgency of surgery. The decision as to which operation to perform depends upon the patient's clinical situation. Other abdominal wall hernias can similarly be repaired to strengthen the defect in the abdominal wall and decrease the complication risk of bowel incarceration and strangulation. Sliding hiatal hernias may be treated surgically to place the stomach back into the abdominal cavity and to strengthen the gastroesophageal junction. However, doctors do not routinely offer surgery because most symptoms are due to GERD and medical therapy is often adequate. Medication, diet, lifestyle changes, and weight loss may help control symptoms and minimize the need for surgery. Paraesophageal hernia repair is done to prevent the complication of strangulation or volvulus. If an inguinal or umbilical hernia is small and does not cause symptoms, a watchful waiting approach may be reasonable. Routine follow-up may be all that is needed, especially if the hernia does not grow in size. However, if the hernia does grow or if there is concern about potential incarceration, then surgery may be recommended. Patients who are at high risk for surgery and anesthesia may be offered a watch and wait approach. Trusses, corsets, or binders can hold hernias in place by placing pressure on the skin and abdominal wall. These are temporary approaches and potentially can cause skin damage or breakdown, and infection because of rubbing and chafing. They are often used in older or debilitated patients when the hernia defect is very large and there is an increased risk of complications should they undergo surgery. Unless the defect is large, umbilical hernias in children tend to resolve on their own by 1 year of age. Surgery may be considered if the hernia is still present at age 3 or 4, or if the defect in the umbilicus is large. Hiatal hernias by themselves do not cause symptoms. Instead it is the acid reflux that causes gastroesophageal reflux disease (GERD). Treatment is aimed at decreasing acid production in the stomach and preventing acid from entering the esophagus. For more, please refer to the Gastroesophageal Reflux Disease (GERD) article. The major complication of a hernia is incarceration, where a piece of bowel or fat gets stuck in the hernia sac and cannot be reduced. Swelling can occur to the point that blood supply to the tissue is lost and it dies. This is called a strangulated hernia. If a hiatal hernia is large, part of the stomach and esophagus can displace into the chest. Depending up the situation and anatomy, the stomach can twist (volvulus) potentially leading to strangulation. This is a surgical emergency. Most patients who undergo elective hernia repair do well. Incisional hernias may recur up to 10% of the time. The prognosis for patients who undergo emergent hernia repair because of incarcerated or strangulated bowel depends upon the extent of surgery, how much intestine is damaged, and their underlying health and physical condition prior to the surgery. For this reason, elective hernia repair is much preferred. While congenital hernias cannot be prevented, the risk of developing a hernia that occurs as life goes on can be minimized. The goal is to avoid an increase in pressure within the abdomen that could stress the weak areas in the abdominal wall. Eat a healthy diet and exercise routinely to minimize the risk of constipation and straining to have a bowel movement. Use proper lifting techniques especially when trying to lift heavy objects. This is important to remember at work, home, and in sports. Stop smoking to decrease recurrent coughing. If a hernia develops, seek medical care to have it evaluated and potentially treated before it gets too large or becomes incarcerated. Fitzgibbons, Jr., R.J., and R.A. Forse. "Clinical practice. 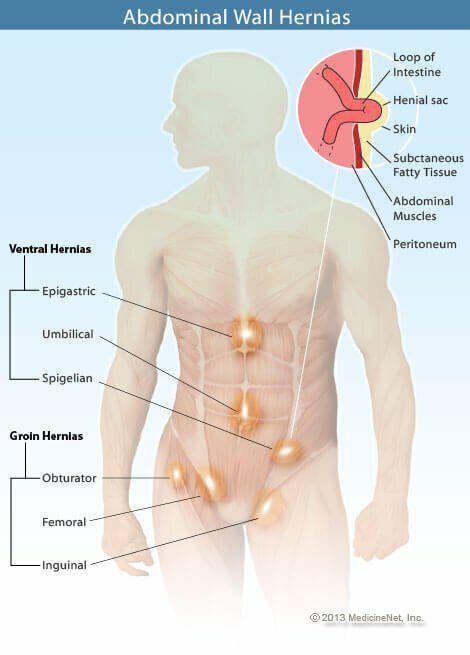 Groin hernias in adults." The New England Journal of Medicine 372.8 Feb. 19, 2015: 756–63. Townsend, C.M., R.D. Beauchamp, B.M. Evers, and K.M. Mattox. Sabiston Textbook of Surgery: The Biological Basis of Modern Surgical Practice, 20th Ed. Elsevier, 2016.